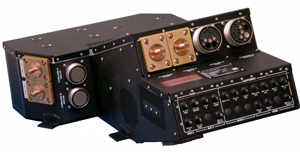 Primary Power Distribution unit (PDU) provides primary power bus connectivity, transfer, and distribution functions to the aircraft loads. It includes a combination of electro-mechanical power contactors and solid state switches to control the power into and out of the unit. The Primary PDU also provides critical circuit protection through a combination of current limiters, circuit breakers, and over-current sensing electronics to protect the power system and electronically controlled devices from dangerous faults. The Primary PDU is designed with a fail-safe philosophy that provides a default operating mode that permits, as a minimum, the application of battery and generator power to the appropriate loads, ensuring that power is maintained on the emergency and essential buses. AMETEK's Primary PDU integrates utility control in the box with light control, fuel balancing, air-conditioning control, air & fuel valve control, WOW logic, fan speed control. The Primary PDU uses AMPHION 75A solid state relays for direct control of loads such as tail deice, windshield heat override, fuel boost pump. It has a standard circuit breaker panel with circuit breaker monitoring. In addition, our Primary PDU's can be seamlessly integrated with our starter generators and generator control units.